The gods have granted you a remarkable advantage in your fight to rule Stormfall - Hero Abilities! Your Hero Abilities provide great Bonuses to your army and Castle! You can also unlock Abilities using Sapphires, but this shall not increase your Wisdom Level. Once unlocked, all Abilities can be activated for free! In the Hero window there shall be two tabs: “Equipment” and “Abilities”. In the "Abilities" tab you can find your Hero Ability Tree, which shows all your Hero Abilities, the Bonuses that each Ability provides, and the Wisdom Level you must reach in order to unlock and activate them. 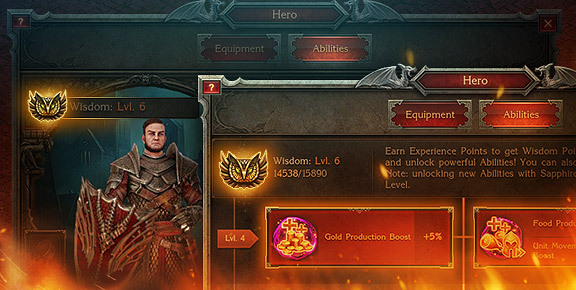 All Lords and Ladies start at Wisdom Level 1, although the first Abilities shall only be unlocked upon reaching Level 2. The "Equipment" tab contains all of your Equipment Items, Equipment Coffers, and special Keys. Battle to rule Stormfall and demonstrate your newfound power! Earn Wisdom points and use your Hero Abilities to defeat your rivals!